It is estimated that 1 in 8 people suffer from social anxiety. It is a universal problem that affects people of all ages, genders, cultures, religions and socioeconomic strata. Social anxiety includes an extremely broad spectrum of symptoms: from specific performance anxiety to pervasive social handicaps.It is often a debilitating illness that can lead to a life of isolation, anguish and even suicide. Incredibly, most people and many mental health professionals lack a functional understanding of the disorder. Plus, little effective protocol exists due to sufferers’ innate resistance to treatment. Social Anxiety is an overwhelming and persistent fear of social or performance situations that can significantly and dramatically limit one’s ability to live a meaningful and productive life. It causes both emotional discomfort through obsessive worry and physical suffering that emanates from the core. These symptoms are always associated with human interaction and are performance based. Social anxiety is the third most prevalent mental health disorder behind depression and substance abuse, and is substantially co-morbid. Current research demonstrates that very little productive clinical protocol exists. Social anxiety is a disease of resistance, which impacts millions of all ages and all cultures. It continues to evolve rapidly due to its dynamic core of “performance” within an increasingly competitive and technological society. 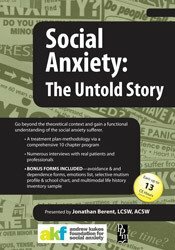 Social anxiety has numerous manifestations including social phobia, public speaking anxiety, which is the world’s number 1 phobia, selective mutism, school phobia, performance anxiety in numerous venues such as work, performing arts, sports, and relationships, as well a technology over-dependence and social skills challenges. In addition, there is a direct connection to such problems as “bullying” and positioning within the social “pecking order”, school violence, and image sickness. Persons with Learning Disabilities and other special needs represent another group significantly impacted by Social Anxiety. This DVD set will go beyond the theoretical context and provide viewers with a functional understanding of the population. It will teach a step-by-step treatment methodology including analytical, behavioral, cognitive, physiological, and family dynamics. Follow along with these real-life client demonstrations. This film series was produced by the Andrew Kukes Foundation for Social Anxiety, Inc. Its ongoing mission is to educate mental health professionals and improve the lives of those affected by Social Anxiety. Please visit their website at www.akfsa.org. Multi-disc DVD recording (10 hours, 53 minutes) with electronic manual and instructions. Challenging the concept of "shyness"
Social phobia as an "addiction to avoidance"
Brain Health: The "hardware of the soul"
Understanding selective mutism as a variation of O.C.D. "Processing” with the SM child: Challenging the "I don’t know disease"
Jonathan Berent, LCSW, ACSW, has provided and supervised treatment for thousands of individuals of all ages with social anxiety and related disorders in individual, family, and group therapy. He has created numerous socialization programs for “special needs” individuals. In addition he has been a stress management consultant to corporations and organizations including NBC, Bloomingdales, and The United Federation of Teachers. Jonathan has been featured extensively in the media including Oprah, Anderson Cooper, CNN Medical News, CNBC, and The New York Times. He has created www.social-anxiety.com. He is the author of Beyond Shyness: How to Conquer Social Anxieties (Simon & Schuster, 1992) and Work Makes Me Nervous: Overcome Anxiety and Build the Confidence to Succeed (Wiley, 2010). This self-study activity consists of 10.5 clock hours of continuing education instruction. Credit requirements and approvals vary per state board regulations. Please save the course outline, the certificate of completion you receive from the activity and contact your state board or organization to determine specific filing requirements. California Alcoholism & Drug Abuse Counselors: PESI, Inc. is an approved provider by the CCAPP-EI, Provider #: OS-03-036-1019. This self-study activity meets the qualifications for 10.5 CEH's (continuing education hours). Connecticut Addiction Counselors: Provider #120924. This course has been approved as a CCB approved training and has been awarded 10.75 hours by the Connecticut Certification Board. This intermediate self-study activity consists of 10.75 clock hours of continuing education instruction. Credit requirements and approvals vary per state board regulations. Please save the course outline, the certificate of completion you receive from the activity and contact your state board or organization to determine specific filing requirements. This self-study activity consists of 10.75 clock hours of continuing education instruction. Credit requirements and approvals vary per state board regulations. Please save the course outline, the certificate of completion you receive from this self-study activity and contact your state board or organization to determine specific filing requirements. Illinois Marriage & Family Therapists: PESI, Inc. has been approved as a provider of continuing education by the State of Illinois, Department of Professional Regulation. Provider #: 168-000156. Full attendance at this self-study activity qualifies for 10.5 credits. Texas Marriage & Family Therapists: PESI, Inc. has been approved as a continuing education sponsor through the Texas State Board of Examiners of Marriage and Family Therapists. Provider #: 503. This self-study activity qualifies for 10.5 continuing education credits. This intermediate activity consists of 10.75 clock hours of continuing education instruction. Credit requirements and approvals vary per state board regulations. Please contact your licensing board to determine if they accept programs or providers approved by other national or state licensing boards. A certificate of attendance will be awarded at the end of the program to participants who are in full attendance and who complete the program evaluation. California Nurses: PESI, Inc. is a provider approved by the California Board of Registered Nursing, Provider #:17118 for 10.5 self-study contact hours. Florida Nurses: PESI, Inc. is an approved provider by the Florida Board of Nursing. Provider #: FBN2858. These materials qualify for 10.5 self-study contact hours. Iowa Nurses: PESI, Inc. is an approved provider by the Iowa Board of Nursing. Provider #: 346. Nurses successfully completing these self-study materials will earn 13.0 self-study contact hours. Florida Occupational Therapists & Occupational Therapy Assistant: PESI, Inc. is an approved provider with the Florida Board of Occupational Therapy. Provider Number 50-399. This self-study course qualifies for 10.8 continuing education credits. This self-study activity consists of 10.75 clock hours of continuing education instruction. Credit requirements and approvals vary per state board regulations. Please save the course outline and the certificate of completion you receive from this self-study activity. Contact us for more information on your state board or organization specific filing requirements. American Psychological Association credits are not available. Florida Board of Psychology: PESI, Inc., is an approved provider with the Florida Board of Psychology. Provider Number 50-399. This product qualifies for 10.8 self-study continuing education credits. Please make sure to bring your license number to the seminar so that we can report your attendance to CE Brokers. This course contains 10.5 hours of self-study continuing education. It was not offered for ASHA CEUs. Please retain your certificate of completion. If audited for ASHA Certification Maintenance, you can submit this certificate of completion at that time. For state licensure, teacher certification renewal, or other credential renewal, contact those agencies for information about your reporting responsibilities and requirements. California Speech-Language Pathologists/Audiologists: PESI, Inc. is an approved provider with the California Speech-Language Pathology and Audiology Board, #PDP 319. This course meets the qualifications for 10.5 hours of self-study continuing professional development credit for Speech-Language Pathologists or Audiologists, as required by the California Speech-Language Pathology and Audiology Board. California Social Workers/ Counselors/Marriage & Family Therapists/Licensed Educational Psychologists: This intermediate activity consists of 10.0 clock hours of continuing education instruction. Credit requirements and approvals vary per state board regulations. Please contact your licensing board to determine if they accept programs or providers approved by other national or state licensing boards. A certificate of attendance will be awarded at the end of the program to participants who are in full attendance and who complete the program evaluation. Florida Social Workers/Marriage & Family Therapists/Mental Health Counselors: PESI, Inc. is an approved provider with the Florida Board of Clinical Social Work, Marriage and Family Therapy and Mental Health Counseling. Provider Number 50-399. This self-study course qualifies for 10.75 continuing education credits. Illinois Social Workers: PESI, Inc. is an approved provider with the State of Illinois, Department of Professional Regulation. License #: 159-000154. Successful completion of this self-study activity qualifies for 10.5 contact hours. Minnesota Social Workers: PESI, Inc. is an approved provider with the State of Minnesota, Board of Social Work. Provider #: CEP-140. This self-study course has been approved for 10.5 continuing education hours. A certificate will be issued upon successful completion of a post-test. Ohio Social Workers/Counselors/Marriage & Family Therapists: PESI, Inc. is an approved provider with the State of Ohio Counselor, Social Worker and Marriage & Family Therapist Board. Provider approval #: RCST071001. Successful completion of this self-study course meets the qualifications for 10.75 clock hours of continuing education credit. Pennsylvania Social Workers/Counselors/Marriage & Family Therapists: This intermediate activity consists of 10.5 clock hours of continuing education instruction. Credit requirements and approvals vary per state board regulations. Please contact your licensing board to determine if they accept programs or providers approved by other national or state licensing boards. A certificate of attendance will be awarded at the end of the program to participants who are in full attendance and who complete the program evaluation. Full attendance is required, variable credits may not be awarded per the Pennsylvania State Board. This self-study activity qualifies for 10.75 clock hours of instructional content as required by many national, state and local licensing boards and professional organizations. Retain your certificate of completion and contact your board or organization for specific filing requirements.